I was so happy about how the Hawk 100 turned out in 2014 that I was very eager to sign up for another race. I was excited that my nutrition plan worked and my body seemed to hold up at least until the last two miles. 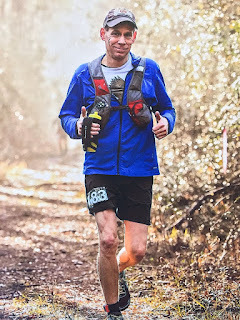 I was very hopeful that if I trained much in the same way and kept to the same nutrition plan, I could improve my time a good deal on a similar course, possibly even pull off a sub-24 hour finish--that is if everything else lined up as well. After deciding to take a year off for volunteering and personal business, I started thinking about what race would be a good fit. I decided on Rocky Raccoon. I had heard many things about Rocky and I was excited that it was a "fast" course and also a qualifier for Western States. I really have no idea how I would make it to Western States on the million to one chance that I'd actually get in, but the idea intrigued me. The thought of a sub 24 hour 100 miler was also on my mind. 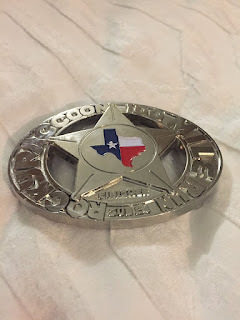 I did a lot of reading and talked to friends who have completed the race in the past. I was confident of the course, the time of the year and the distance from home. I knew that there was similar terrain in the Lawrence area and I would be able to train adequately over the winter months. I just had to stick to the plan I used for the Hawk. I chose Hal Koerner's training plan from his Field Guide to Ultrarunning. It was similar to the milage I put in for the Hawk and I figured if it worked for Hal, it would work for me =) I plotted the dates on my calendar and my journey had begun. A few weeks out from the race I finally realized that driving down, running, and then driving back the next day all alone was a really bad idea. I figured that I could finish without a pacer but I really needed help with the driving. As it would end up, I was very, very grateful to have both. Allen Levine and Paul Endacott, two good friends from the Trail Hawks, were both available and agreed to help with the drive and pacing me for the last 40 miles of the race. I couldn't have been more fortunate. We arrived in Huntsville the day before the race so we could scout out the course. The logistics of a 12 hour drive and waking up at 5am the next day for a race was just too overwhelming. This also allowed us to pick up my packet and attend the race briefing the night before. We checked out the course and went out for a big lunch. I planned to eat a light dinner to avoid any race day "complications". 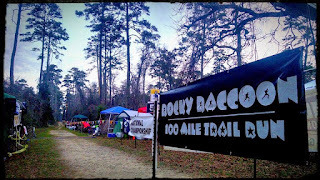 Later that night we returned to the park for the race briefing and packet pickup. We visited with friends and other runners, set up the largest awning in park history (Thanks again Paul) at the start-finish line, and headed back to the hotel. We got to bed early and I actually slept very well. I woke refreshed and ready. A quick shower and we were on the way to the park. The line to get in wasn't too bad and we arrived in plenty of time for pre-race jitters. The start of the race was fairly typical. The course was wide enough in spots to allow me to move up and get in a good spot with the right pace group. I started with my my old headlamp as to keep my new Petzl at a full charge. We snaked around by the lake in the dark and out past the park entrance and the field started to thin out. We all blazed past the first aid station and thinned out even more. By the time we reached the Disco Damnation aid station (~6 miles) where our drop-bags were located, things were feeling good. I dumped the headlamp, grabbed some Pringles, and filled my water bottle. It was roughly a 7 mile loop back around to Damnation again before heading back to the start. 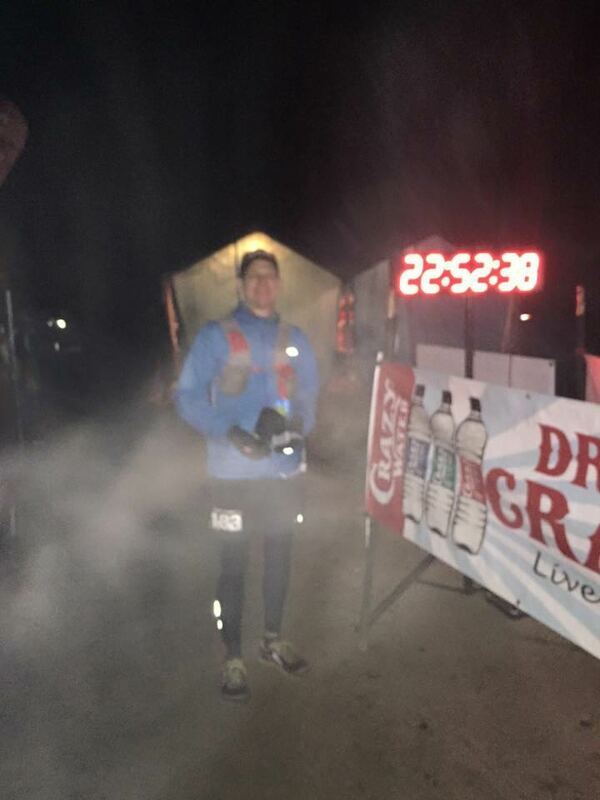 There was another aid station between Damnation and the start/finish but no drop-bag. As it turned out, I never touched my drop-bag after depositing my headlamp (That's a good thing). I made my way back to the start without issue. I felt great, I was eating, drinking, peeing, and everything was falling into place just as planned. My nutrition plan generally consists of 4 things; gels, Tums, salt-caps, and water. Everyone has their thing that works for them and this is what I found works for me. It's not flawless and it's not glamorous, but it works. Every 30 minutes I eat some kind of pre-packaged, pre-measured (~100 calories), artificial food substance (gel, waffle, or chew) and either a Tums or a salt-cap (or both) depending on the temperature, how much I've been sweating, and how my stomach feels. I typically try to drink about a bottle of water during this time as well--this also depends on the temperature. I usually graze on bland potato-based items at aid stations as well and an occasional orange or banana. I stay away from candy or anything too spicy. I didn't really stop after the first loop. My crew was getting rest for the long night ahead and I didn't really need anything at the start/finish. I filled my bottle and headed out again. I was eating a lot, maybe too much (more on that later) and I was feeling really good physically. On the second loop I met Katie from Denver. She was running at a pace I liked and we started a good conversation. She was planning a 22 hour finish I think and that was just what I wanted to hear. This was her third or fourth time at Rocky so I figured she would be a great resource and if I could stay with her I would be doing great. We ran most of the second loop together but I lost her somewhere at the start/finish before the start of the third loop. Strangely enough, when I mentioned I was from Kansas, she knew a few of the Trail Nerds. Ultra-running can be a pretty small community some times. Heading out for the third loop I was ready for some music. Miles 40-60 would be a big chunk before picking up Al for the fourth loop and I was ready to zone out. I had plenty of good new music and a Louis L'amour book on Audible to keep me occupied. It was cooling off but I was ahead of schedule. I was pretty sure I'd be back to the start/finish before dark and I had more clothes and a headlamp at Damnation so I didn't take any other gear with me. Coming in from the third loop and starting the fourth loop was the only real "highlight" of the race. I made a quick (quick as possible after running 60 miles) trip to the porta-loo and felt much better--apparently I was eating too many Pringles. I decided to change into my tights for the evening since I knew it was going to be in the 30s. Of course my mind was on not sitting down at any cost so I attempted this standing up. I ended up rolling around on the ground in my underwear with my shorts around my ankles. I was lucky I didn't get hurt or pull a muscle falling over. I found a more suitable spot for changing and was quickly bundled up and ready to roll with Al for the fourth loop. We rolled out for the fourth loop with headlamps in hand braced for approaching darkness. It descended like a sodden veil over the sandy Texas soil and with it came a bone-chilling cold. Okay, enough of that... I was very glad for the company on the fourth loop. I've run many miles with Al and his conversation was welcomed. I'm not sure if it was Al's pacing skills, the conversation, the cold temperatures, or just my awesome training plan but I was still feeling really good and kept a decent pace. I did welcome the addition of hot potato soup with ramen noodles to the menu at the aid stations. Now this course was very similar to the trails I have been training on. There are always going to be obstacles and being mostly in the forest, there are trees. When you add trees, running at midnight after 70 miles, something is bound to happen. Coming back to Damnation on the far side of the lake I managed to take a sharp stick in the eye from an encroaching tree limb--it's about as fun as people say. It certainly felt a lot worse than it looked; perhaps it was the cold. I guess it was more of a wakeup than anything cause I really poured on the steam (as much as possible at this point) on the way back. I need to track down my splits but I remember feeling really good on the back dirt road (a rolling 2-3 mile stretch). On the last loop the cold really set in. I am pretty good at regulating my body temperature so wasn't too worried. I think I can run in just about any temperature with a base layer, a light long sleeve layer, a wind jacket, gloves and a hat. Although the key at this point isn't really in what you're wearing, but being able to keep moving. You can be running in a sleeping bag but if you're clothes are wet from sweating for 15+ hours, you're calorie starved, and you can't generate any body heat, you're going to get cold when it's 35 degrees. At this point in the race I was walking the hills and walking when I while eating. Each time I slowed down to a walk, I would get cold. Someone once told me to run slow and walk fast and that's just what I was doing. During my training I spent many a cold, rainy, winter day walking on a treadmill at 15% incline--it was time for that to pay off. With Paul's conversation, chicken broth, mashed potatoes (an occasional orange slice), and the smell of the finish line, I managed to hold on to my 2 hour cushion that I had built up over the day ensuring me of a sub 24 hour finish. A couple miles out from the finish line Paul went on ahead to let Al know I was close. As I approached the finish I kept looking for a photographer but never saw one. I thought that was a bit unusual as I had seen many photographers throughout the day. I guess Enduro Photo didn't think people would like finish line pictures and at $25 a pop, I'm not sure I would have bought one anyway. Al managed to get a couple shots but it was really cold and the creepy mist didn't make it easy. I can't thank Al and Paul enough for taking such great care of me. It would have been down right miserable without them. I always try to be as minimal of a runner as possible but when it comes to 100 milers, there is no substitute for experienced runners looking after you when things start to get dicey. Overall, I couldn't be more pleased with the outcome of my Rocky Raccoon 100. Everything went just as planned and that doesn't happen often given the number of variables at hand. I had the company of great friends, at a very well run event without any bad weather. I couldn't be more grateful to be able to do these things with such great people. I managed to successfully test out my nutrition plan again and have a great race experience. I think I am ready to try my hand at a more difficult race. Possibly something in the mountains for next year.